Farmhouse Fête’s design and floral teams have created eight unique centerpiece looks to capture the essence of the country fête. We started with our favorite floral looks, then edited each vase, votive, riser and table number until we achieved the perfect tablescape. Below, you'll find the floral image that inspired us followed by the items we've chosen to complement its look. 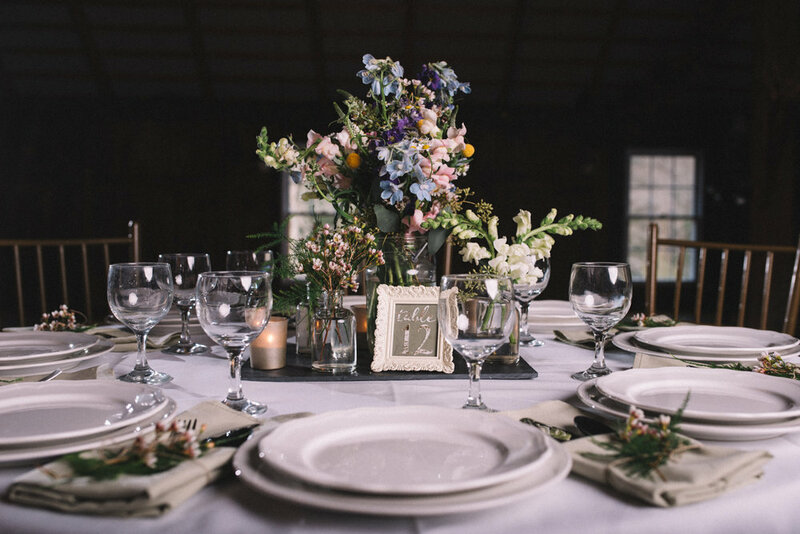 And of course the florals are all signature Farmhouse Fête arrangements, and the items below it are all available to rent on first-come, first-served basis. All floral arrangements shown below are conceptual. 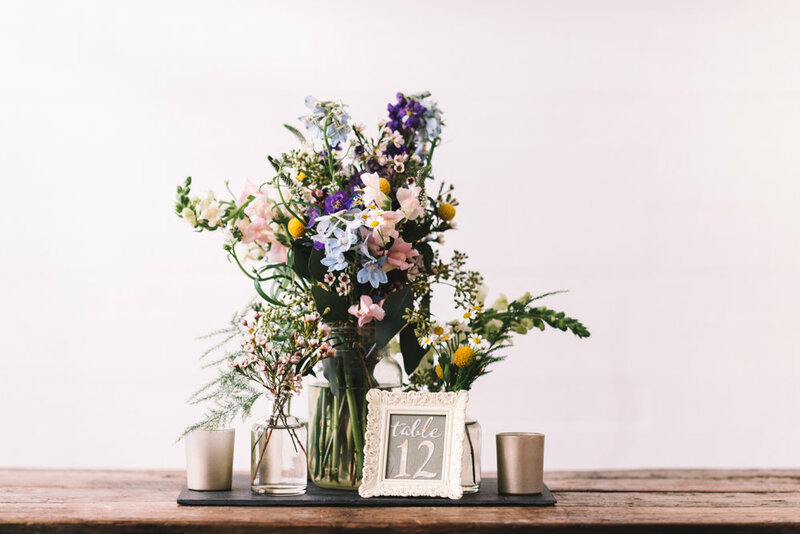 Amy, Farmhouse Fête’s lead florist, will work with you to create your perfect floral vision. Contact Amy at amy@farmhousefete.com. Floral: This beautifully detailed glass pedestal dish is the perfect size and height (7 1/2'' tall x 6'' wide) for an uncluttered table. The deep green glass pairs beautifully with any color scheme and allows for a free flowing and organic looking floral design. Design: When we saw the original antique Fenton glass compote that Amy wanted to design around, the design team scoured antique shops until we found 20 in perfect condition. This piece is stunning and understated at the same time, so we looked for complements that were equally feminine and stately. 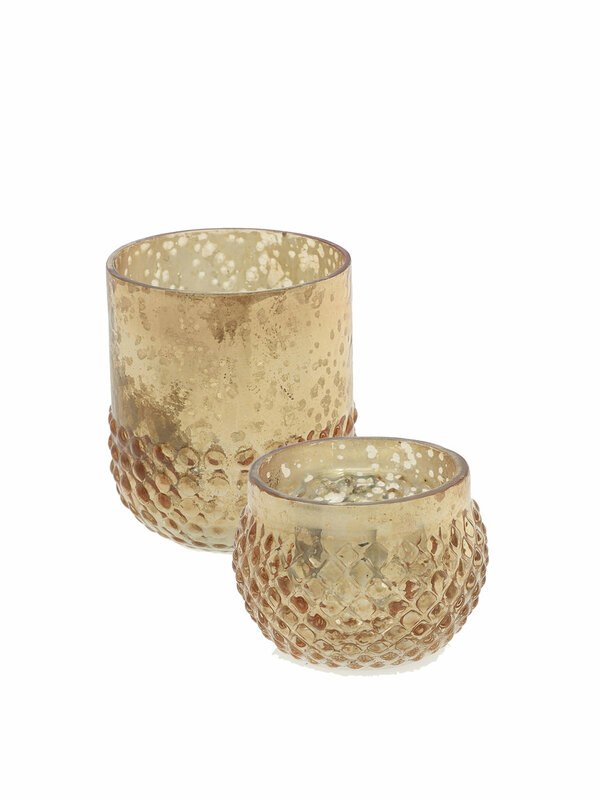 The addition of a simply framed table number and rose gold colored votives make this collection versatile, compact and polished. 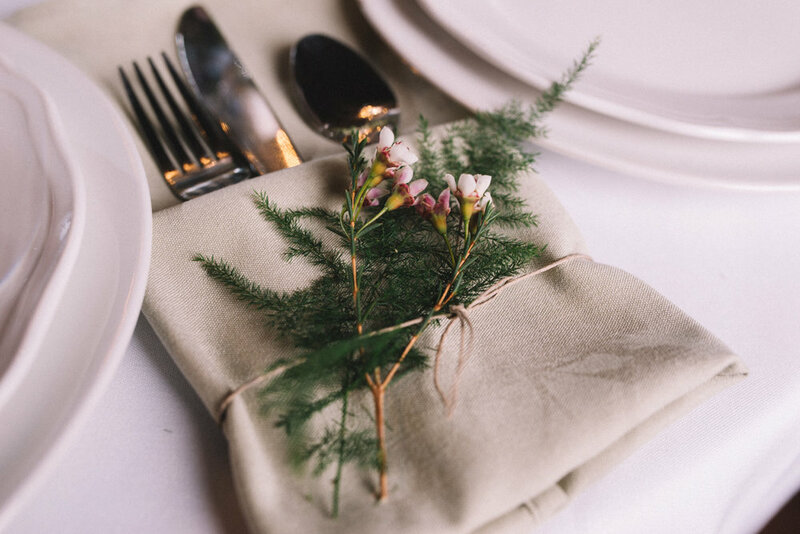 Floral: A simplified version of option 1, this centerpiece offers a more traditional approach to your table. With a smaller pedestal (3 inches tall) and smaller diameter (3.5 inches wide), it is low and perfect for a smaller centerpiece. 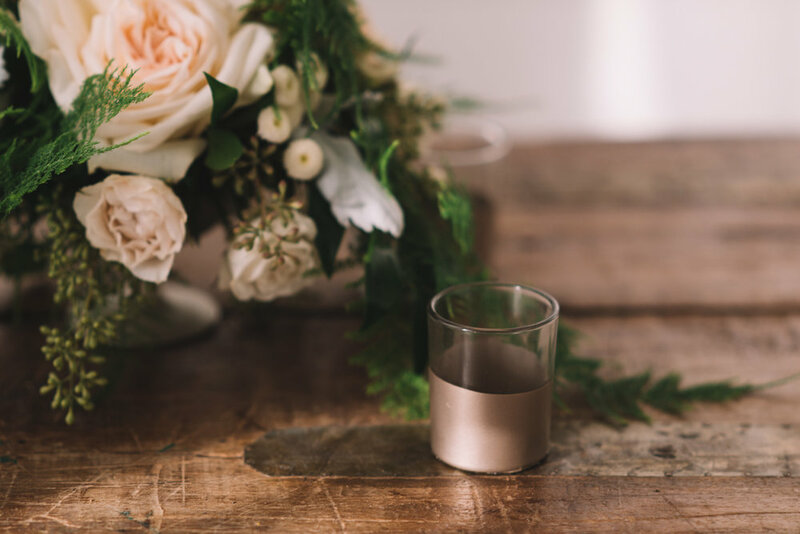 The neutral champagne color goes well with most floral choices and despite it's small size, it can stand up to a variety of sizes/shapes of flowers. 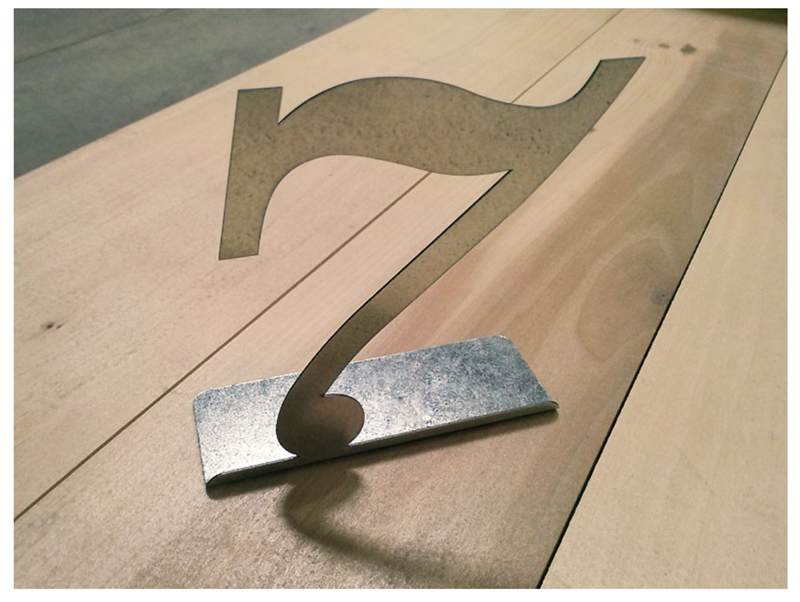 Design: We've discovered more modern metal table numbers in a champagne color to match the dipped votives. 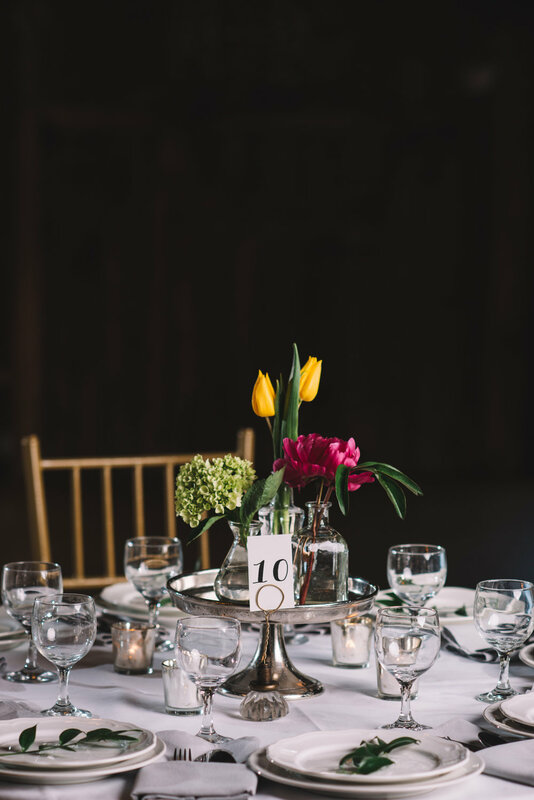 This is a great option for centerpieces that are compact and simple without sacrificing style. Floral: This mercury glass vase in a golden-bronze finish is unequivocally vintage glam and pairs nicely with other metallic shades. It is best used with a more structured arrangement. It perfectly complements monochromatic blooms in a single variety, such as the roses featured in the photo or fluffy white hydrangeas. 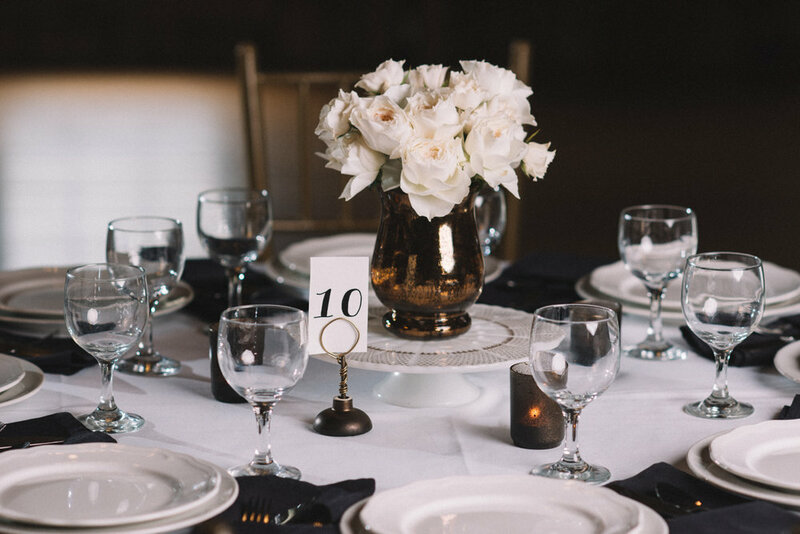 Design: Bronze votives add drama to this table's elegance, while the unique door knob table number holder literally brings something new to the table! Floral: Nothing says country wedding like mason jars and wildflowers! We've taken it up a notch by using authentic antique jars with metal accents around the rim. We then paired it with 3 small bottles to highlight individual blooms. 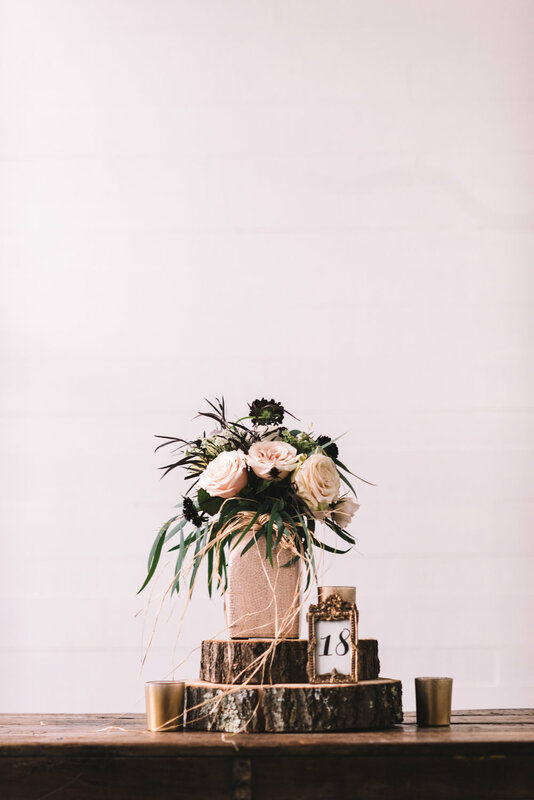 Design: Placing the arrangement on a distressed cream pedestal helps to define the space and bring out the sweetness of a wildflower bouquet. 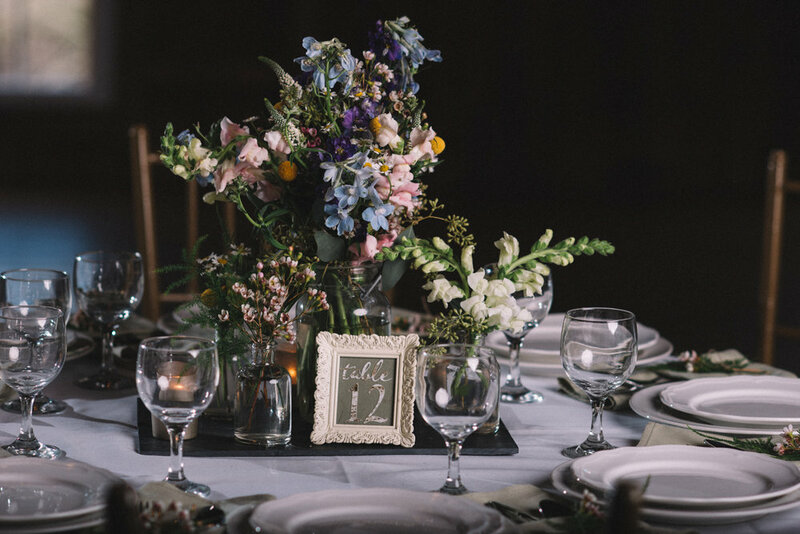 Chalkboard table numbers on a neutral colored holder and mason jar votives allow the wildflowers to stand out in any color combination. Floral: Clean, simple and modern. Using only one bloom per bottle allows for high impact. This look is best suited for statement flowers with a big wow factor, such as fully opened peonies, fluffy garden roses or hydrangeas. Whether you want a mix of bold colors or softer shades, this is a great choice for creating a high impact design. Design: This unique centerpiece will leave your guests in awe. We lowered the vases directly onto the table but added two taller bottles to amp up the drama of these stunning single blooms. 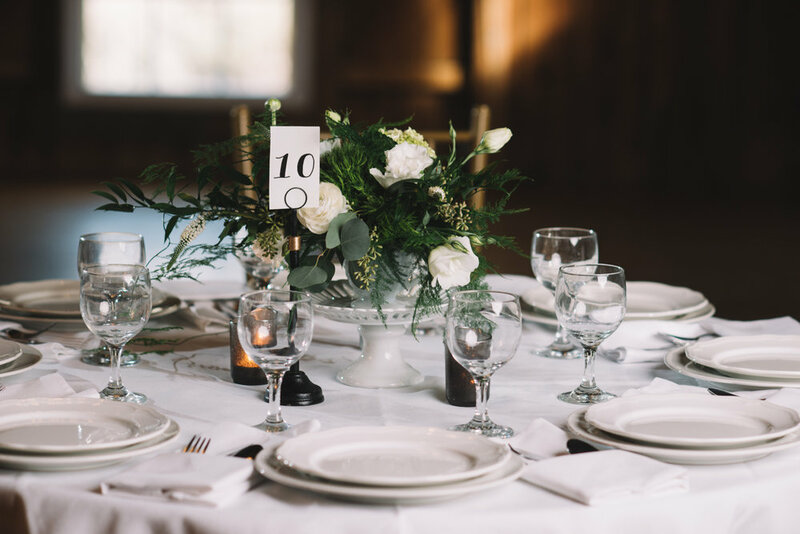 The antique shapes of the bottles, silver mercury glass votives and vintage door knob table number holders bring this very modern look seamlessly into a countryside setting. Floral: When we heard what the design team wanted to do with this centerpiece, it took us a moment to fully understand. But now that we see their ideas (below), we couldn't be more thrilled when we added an industrial edge to lush greenery and white accents. Design: Our unique black pedestal puts an industrial twist on relatively monochromatic arrangements. 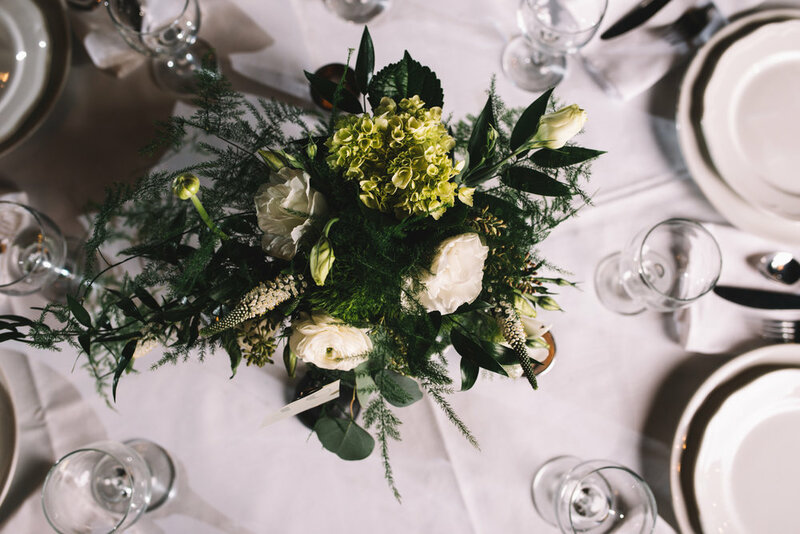 The key to making this centerpiece stand out is using rich greenery. We've added a wrought iron and brass telescoping table number stand, gold votives and simple table number. The rustic pedestal adds much needed height and definition without overtaking the table. You won’t be able to find this rare centerpiece anywhere else! 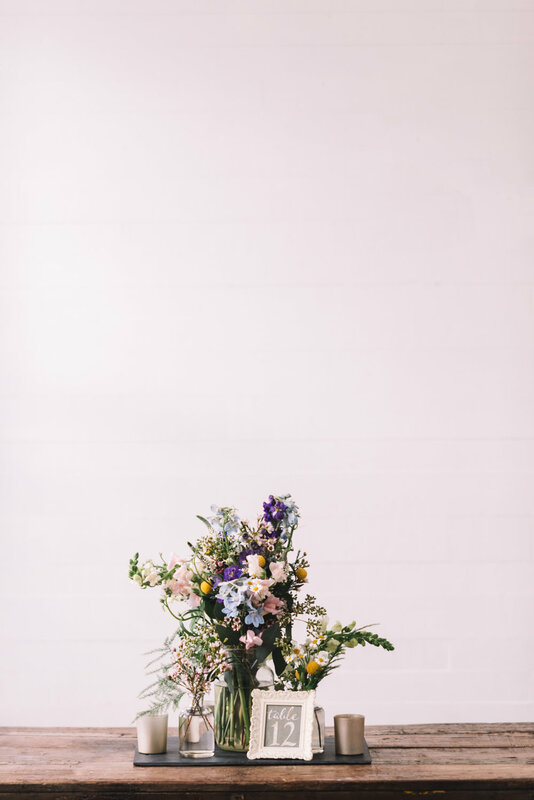 Floral: A natural wooden planter box overflowing with a variety of fresh-picked buds and blooms makes this centerpiece charming and full of joy! Best used for a "farm stand" kind of look, it lends itself well for a more natural and free flowing floral approach. The flowers meander and flow wherever they desire, spilling over the sides wherever it suits them. Design: It's hard to improve on this one for a countryside event. We added some additional depth to the tablescape by alternating wooden boxes with multi-height bottles with single blooms. This helps reduce the overall number of blooms required without diminishing the impact. 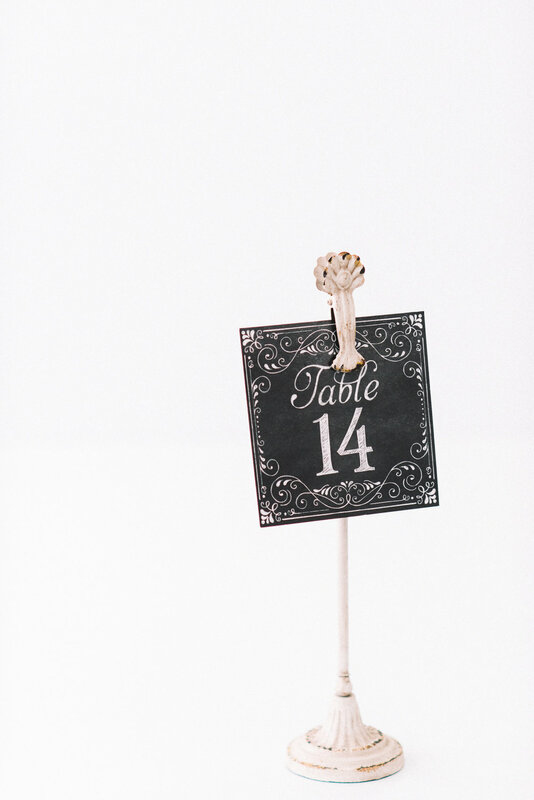 The table numbers mimic the whimsy of a chalkboard while the votives add a nice sparkle to the table. Floral: Elegantly rustic. The charming cream crackle finish vase complements the lovely muted shades of sage green, soft tan, ivory, burgundy and other colors. 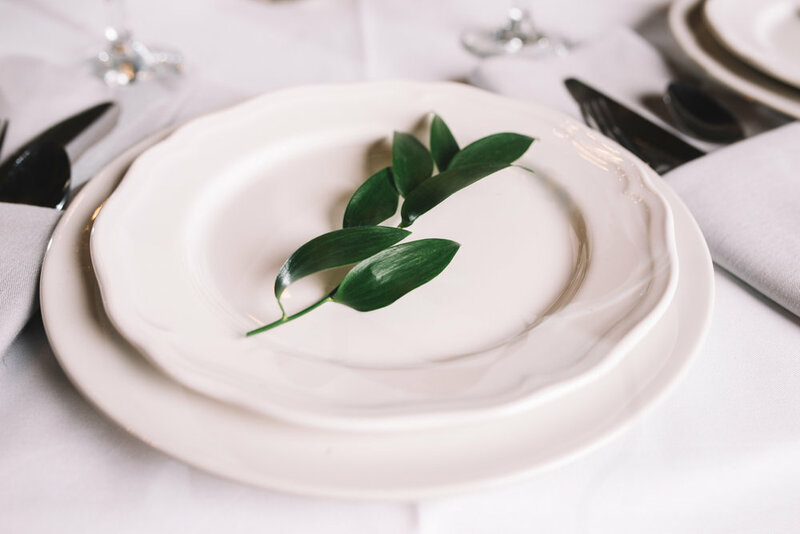 Design: Perched atop two varying sizes of log rounds adds more definition to the table, and the raffia ribbon complements this rustic tablescape. 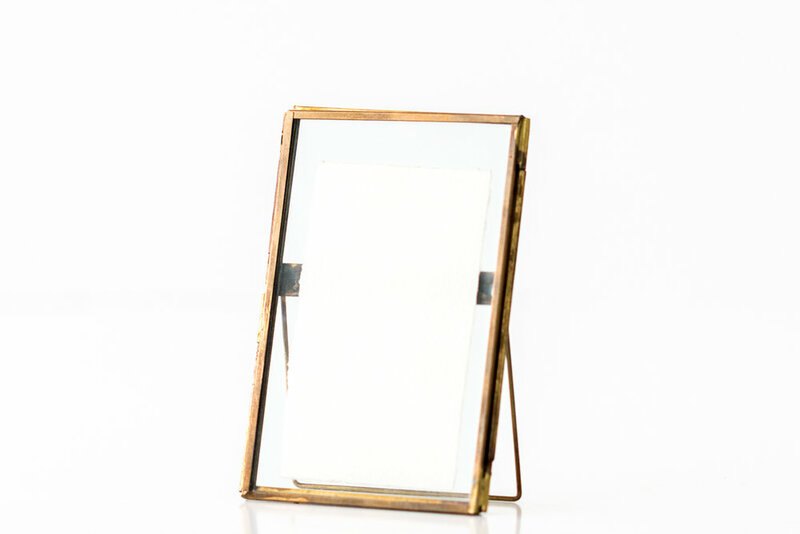 We chose to pair it with a bronze picture frame table number and bronze votives. Nobody said rustic couldn't also be elegant!